HDMI has quickly become the de-facto connection standard for home theater. Its adoption by both manufacturers and consumers alike has been almost universal. HDMI is, however, an evolving interface that is changing rapidly. To that end, we feel that it is important to educate and inform you about the various differences between the versions and specifications of HDMI now on the market. HDMI was first conceived in 2002 by Hitachi, Panasonic, RCA, Silicon Image, Sony, and Toshiba to replace the existing DVI specification. HDMI is fully backwards-compatible with DVI, via either an HDMI-DVI cable or an adapter. DVI is a video specification / connector only and thusly when you convert the signal no audio will be transmitted. Both DVI and HDMI employ the same encoding scheme to relay information. A number of revisions to the HDMI specification have been proposed and adopted since its launch in early 2003. At the time of this writing, the current HDMI specification is HDMI v1.3a. These specifications apply primarily to the transmitters (the source) and the receivers (the target) devices. HDMI cables have their own specifications, as outlined in Chapter Three. The revision history is summarized below along with the technical definitions. Added support for DVD Audio. Consumer Electronic Control (CEC) features, command sets, and CEC compliance tests fully specified. Consumer Electronics Control is a channel within the HDMI connection dedicated to a set of advanced control functions. It is an option available at the manufacturers’ discretion to allow devices that are connected to each other via HDMI to control each other in useful ways. Consumer Electronics Control has been branded differently by many manufacturers such as JVC (EZ-Sync), LG Electronics (Simplink), Onyko (RIHD), Panasonic (Viera Link), Samsung (Anynet), Sharp (Aquos Link), Sony (BRAVIA TheatreSync), and Toshiba (Regza Link). HDMI 1.3 now adds support for x.v.Color. x.v.Color is the consumer name for the IEC color measurement system 61966-2-4. It is also known as xvYCC, and supersedes the previous specification 61966-2-1, which is the sRGB color space. x.v.Color supports 1.8 times as many colors as its predecessor, and allows the enabled device to display any color viewable by the human eye. Deep Color is another feature new to HDMI 1.3. While previous versions of HDMI only supported 8-bit color, the addition of Deep Color support allows HDMI to support 10, 12, and 16-bit color depths. This increased bit depth will reduce posterization (or false contouring as it is known on fixed-pixel displays such as plasma and LCD display devices) on your display device. The new HDMI 1.3 specification now offers support for two new uncompressed audio formats, Dolby TrueHD and DTS Digital Entertainments’ DTS-HD Master Audio. In addition, it is fully backwards compatible with all previous compressed audio formats (such as Dolby Digital and DTS). Lip Sync is a new feature introduced in the HDMI v1.3 specification. Auto lip synchronization is the technical term for matching lip movements with voice. This compensates for signal processing delays in the ever-increasing complex world of digital processing. The new mini-HDMI connector, otherwise known as a Type-C connector, is designed for the new lines of portable recording devices (such as high definition camcorders and digital cameras) now hitting the market. An illustration of this connector is provided in Chapter Two. There are no performance differences between this connector and the original Type-A HDMI connector. There are many different brands of HDMI cable on the market, and the prices for these cables range from affordable to ridiculous. Cables are an important part of your home theater installation, and the rule of thumb has always been to never go for the dirt cheap cables. HDMI, as mentioned, is a digital signal. It is therefore in the “on” position, representing one hundred percent quality, or in the “off” position, representing zero percent quality. There is no degradation of the signal or poor picture (or sound) quality derived from a cheap HDMI cable versus an expensive HDMI cable. In analog form, picture degradation occurs when other radiated signals conflict with the information being sent through the cable. This leads to uniformity errors such as random lines in the picture, snow, and luminance problems. These problems do not arise within HDMI cables due to the fact that the information in a digital signal is encoded differently than it is in an analog signal. The total number of displayable pixels (DP) can be obtained by multiplying the native resolution of your display device. For example, if the native resolution is 1920 x 1080, the total number of displayable pixels is 2,073,600. There are two types of HDMI cable on the market. Standard HDMI cable (otherwise known as “Category 1”) has been tested to perform at speeds no less than 75 MHz. This is the equivalent of a 1080i signal. High Speed HDMI cable (otherwise known as “Category 2”) has been tested to perform at speeds no less than 340 MHz. According to the HDMI Licensing Group, this is the highest bandwidth currently available over an HDMI cable. These cables are designed to handle resolutions up to 2560 x 1600. Naturally, High Speed HDMI cables will also handle 1080p signals, including those with increased color depths and increased refresh rates. HDMI does not currently have a specification in place concerning the maximum length of an HDMI cable, be it Standard or High Speed. The group that oversees the specifications of HDMI (HDMI Licensing Group, LLC) only specifies the minimum performance standards of the cable, not the length. However, it should be noted that it is not just the cable that factors into carrying an HDMI signal, but also the technology within your television or video projector. The receiver chip within these devices that includes a feature known as Cable Equalization possess the ability to compensate for weaker signals, which would therefore extend the potential length of the cable. There are HDMI cables on the market longer than ten meters. However, these cables will be flaky at best with high-bandwidth signals. If you are running a 720p or 1080i signal, they may work just fine. If you upgrade your signal to 1080p or increase the color depth, you will likely find that these cables will cease to function. Should you have to cover a distance greater than ten meters, there are three of options available to you. 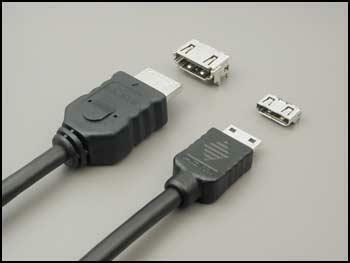 You could use an active HDMI cable, which has electronics built into the cable to extend and boost the cable’s signal. Alternatively, you could use a repeater, which decodes and then re-encodes the HDMI signal between your cables. This option could become quite expensive if you need more than one repeater, and in the event of a connection failure would be a nightmare to troubleshoot. The final and recommended option is to use a CAT5/6 twisted pair transmitter and receiver. This would give you an effective distance of approximately two hundred meters. As mentioned in Chapter One, a new connector type is now available with HDMI v1.3. It is a smaller form factor designed for devices such as high-definition camcorders and still cameras. It is illustrated below. As we mentioned at the beginning of this chapter, there are many different brands of HDMI cable on the market. Some are affordable, others are not. At the time of this writing, all HDMI cables are manufactured or assembled in China. To the best of our knowledge, the three OEM companies that manufacture all of the HDMI cables on this planet are CoPartner Tech Corporation, Der An Electric Wire and Cable Company, and Sure-Fire Electrical Corporation. If you have an HDMI cable in your hand, it began its life at one of these three companies. A common misconception is that an HDMI video connection will provide a better signal than its predecessor, a component video connection. It is often assumed that “digital is better” but it is not as cut-and-dry as you may think. The truth is that the quality of the signal depends more on your source than on the cable. Some sources look better with HDMI and some sources will look better with component. The best way to determine which cable is better is to plug the cables in and give them a try both ways. In our experience, we have found that component video cable is more robust over long distances and tends to be more economically priced as well. HDMI cables work very well up to approximately ten meters. Beyond that distance, it may be necessary for you to purchase a repeater or look into a twisted-pair solution (such as the CAT5/6 transmitter and receiver) to ensure that there is no signal loss. As a final note, there are no HDMI to Component video cables on the market. This is due to the fact that it is not possible to directly convert a digital signal down to an analog signal, because the two signals have no common method of communicating with each other. The only method available to switch these two signals is via an active converter, which are very expensive. Should you choose this route, however, the conversion may not work due to the fact that HDMI carries many sources that are HDCP copy-protected, and analog video connections have no method to decipher this encryption. Chapter Four: What is HDCP? HDCP is an acronym for High-bandwidth Digital Content Protection. Developed by Intel Corporation in partnership with Silicon Image in 2005, HDCP is a form of proprietary digital copy protection designed to protect both audio and video across various high-bandwidth interfaces. HDCP, like HDMI, has also gone through a number of revisions since its launch in 2005. The current revision is version 1.3. Unlike HDMI however, there is no homework for the consumer to do. You will never need to know or care what version of HDCP is encrypting your digital signal. With respect to HDCP, what you have to keep in mind is that all of your devices must be HDCP compliant. If they are not, then you will run into nothing but problems. For example, if you have a digital satellite receiver and you connect it via HDMI to your plasma monitor that does not support HDCP, then you will not receive a picture. Older home theater devices, such as anything built prior to 2005, will not support HDCP. In this case, it may be wise to consider using component cable for any additions to your home theater setup, rather than re-purchasing equipment that is HDCP compliant. Alternatively, there are devices made that will circumvent the HDCP copy-protection; we recommend, however, that you check if these are legal in your country of residence prior to purchase. All HDMI cables are HDCP compliant. No matter what brand of HDMI cable that you decide to purchase, it will be compliant with all versions of HDCP. HDMI is unique in the fact that it is ever-evolving. The specifications are constantly changing, which in turn creates all sorts of confusion for the consumer. Essentially, when purchasing consumer electronics products that possess an HDMI connection, ensure that the revision of HDMI is the most current, which at the time of this writing is version 1.3a. As mentioned in Chapter One, many new features were added. HDMI v1.3 is the most significant upgrade to HDMI since its creation. It is important to ensure that any of your new purchases are compliant to the latest version of HDMI due to the fact that it is not possible to update your home theater devices from an older version of HDMI to the current version. It is also important to note when shopping for HDMI-enabled devices to not only look at the version of HDMI, but to also check the features offered on the product. This is due to the fact that the HDMI specification does not mandate any of these new features; they are optional and at the discretion of the manufacturer of the product.